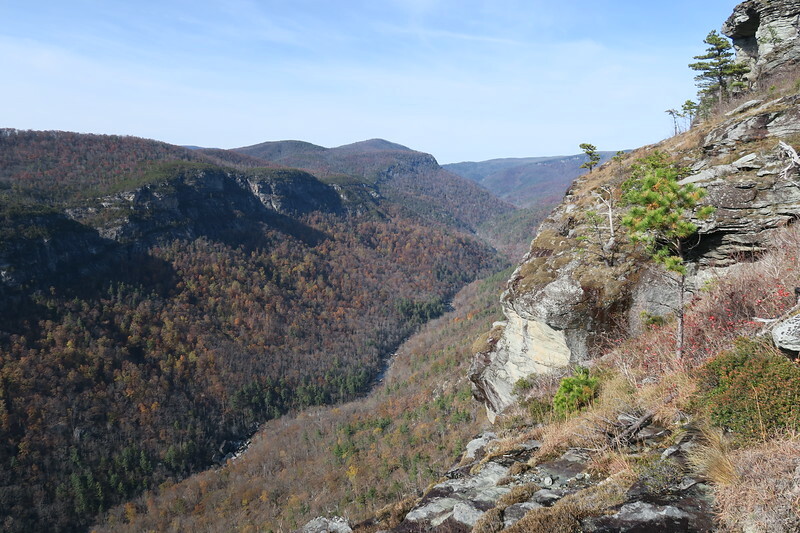 This is, flat out, the most spectacular dayhike you can take at Linville Gorge. 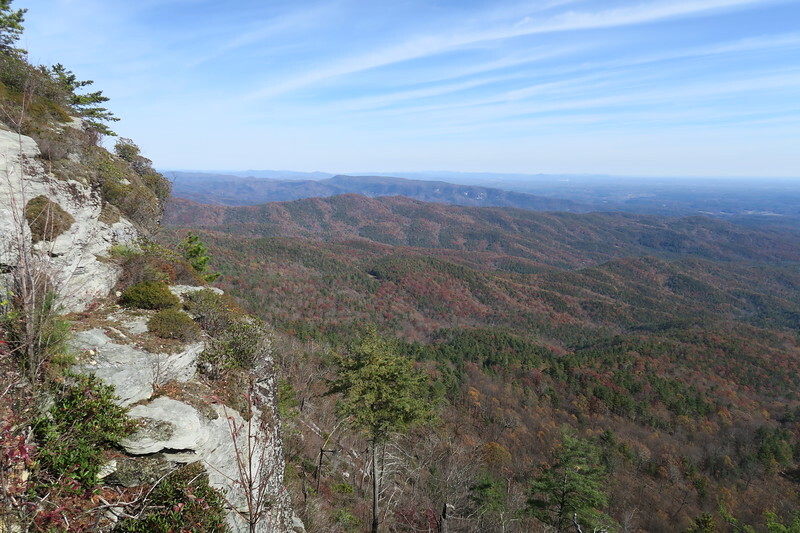 It may well be one of the most spectacular hikes to be found anywhere in North Carolina for that matter. 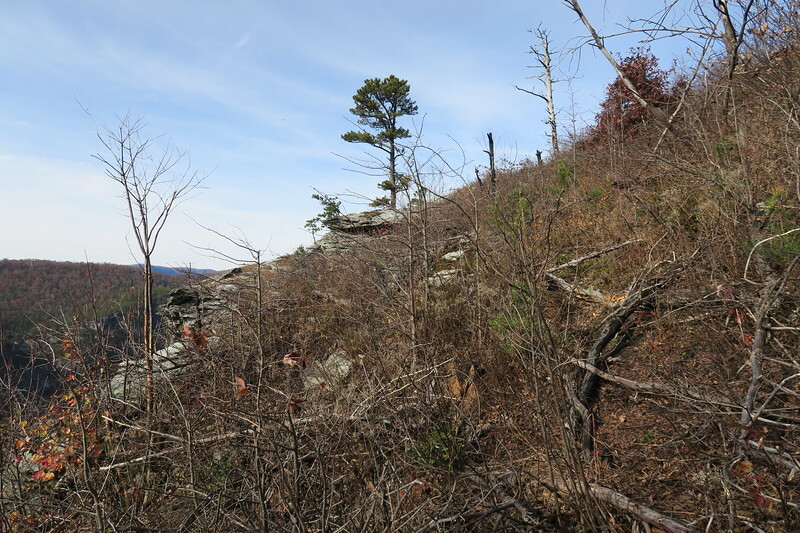 The natural beauty that surrounds you on this combination loop/out-and-back hike from the Table Rock area is almost overwhelming in its ruggedness and majesty. 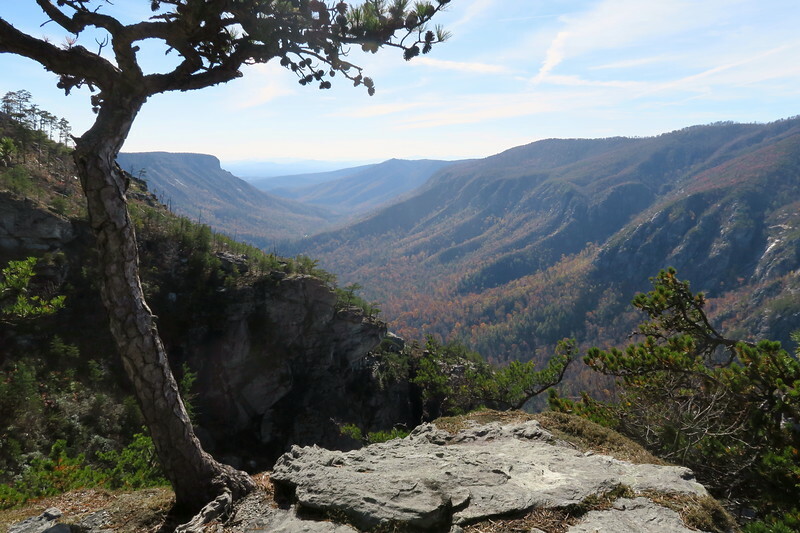 Granted, if you know of Linville Gorge then ruggedness and majesty aren't descriptors which will surprise you. 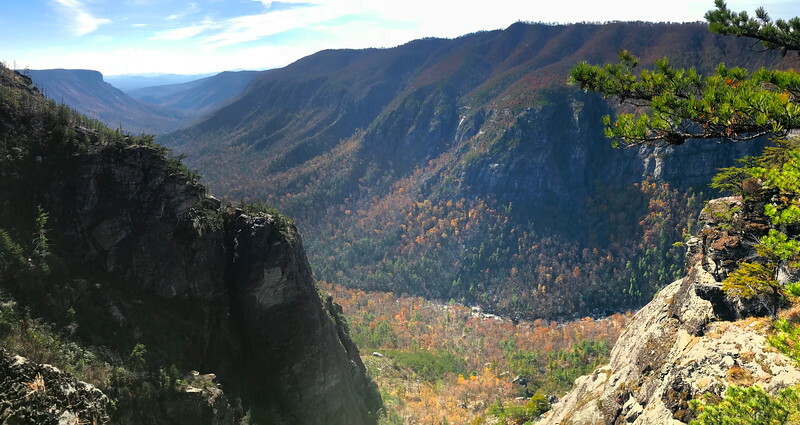 Carved out of the eastern flank of the Blue Ridge Mountains to the northeast of Asheville, Linville Gorge reaches depths of nearly 2,000-feet and is surrounded on all sides by cliffs and peaks of incredible beauty. 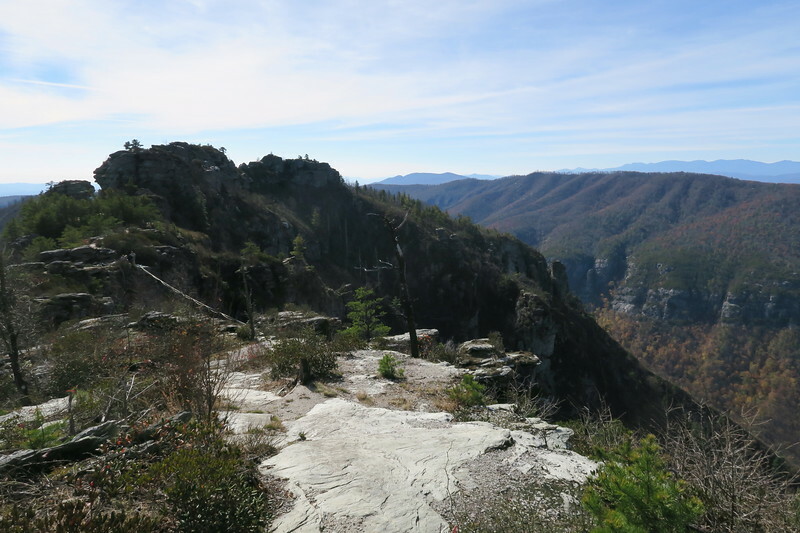 A well-established trail system leads along both rims of the Gorge as well as down to and along the Linville River itself but, with very few exceptions, this isn't a place for the novice hiker. 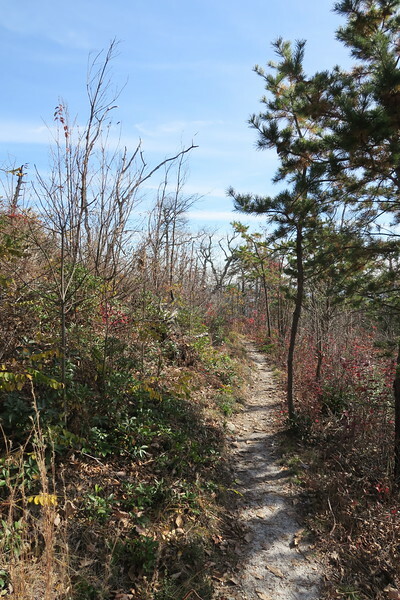 With that said, this particular hike definitely isn't for the novice hiker. 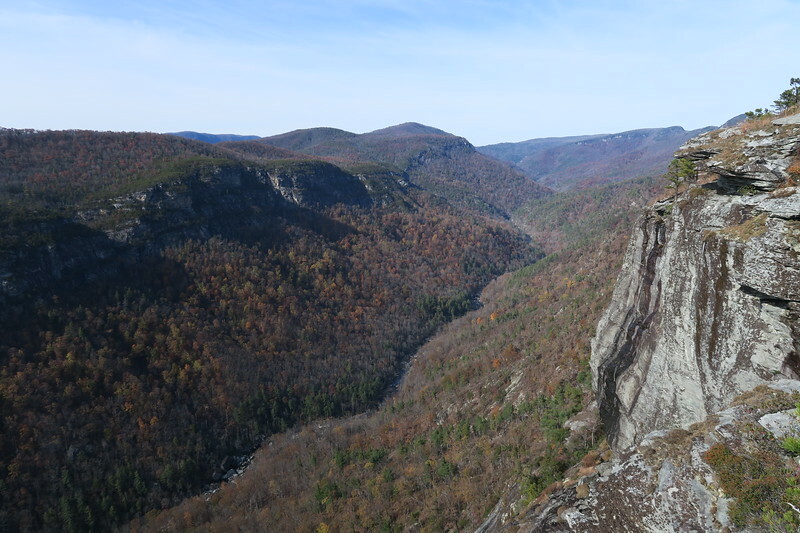 If you want to explore as I did you're going to have to have yourself a good map (I recommend the free Linville Gorge map on the Avenza app) and be comfortable with route finding and traversing high exposed cliffs. Just be warned. 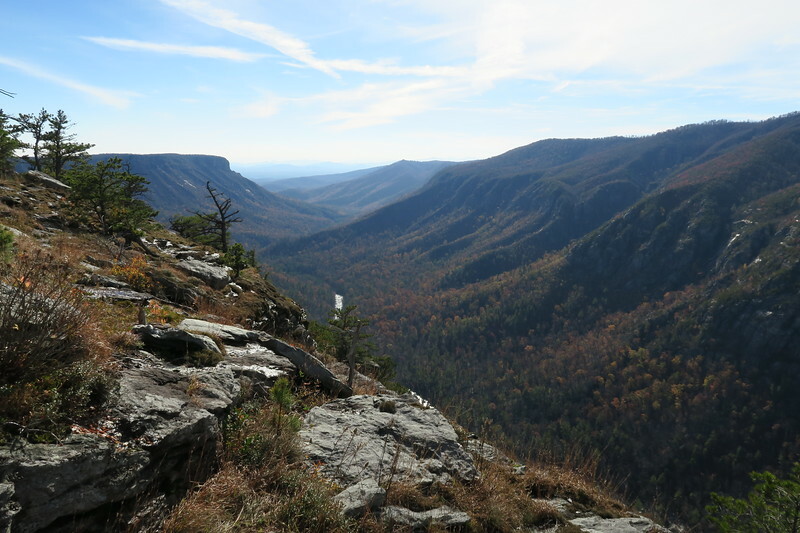 This trek begins and ends at the wildly popular Table Rock parking area on the east rim of the Gorge. 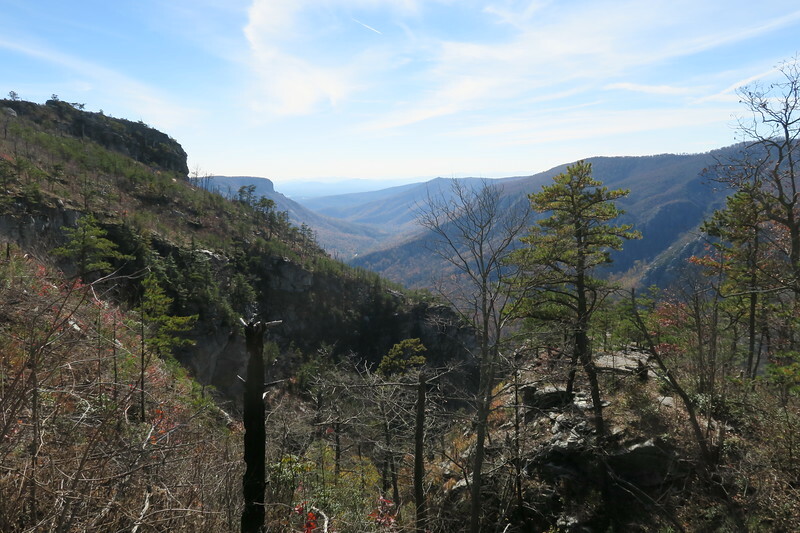 Along my route I'd be visiting both some of Linville's most popular spots as well as some of its more unknown destinations. 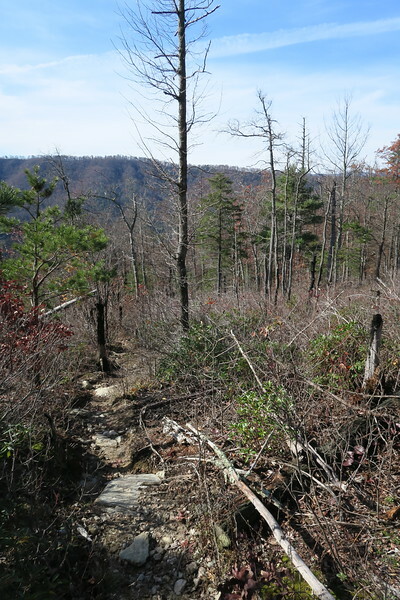 I'd summit the popular Table Rock, enjoy a walk through The Chimneys (twice! 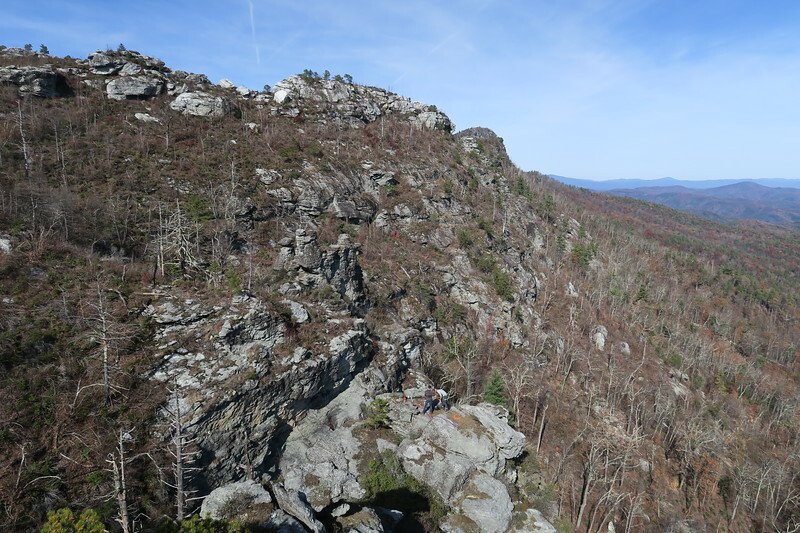 ), stop by a place known as the Devil's Cellar, and walk the precipitous clifftops of The Amphitheater and North Carolina Wall. 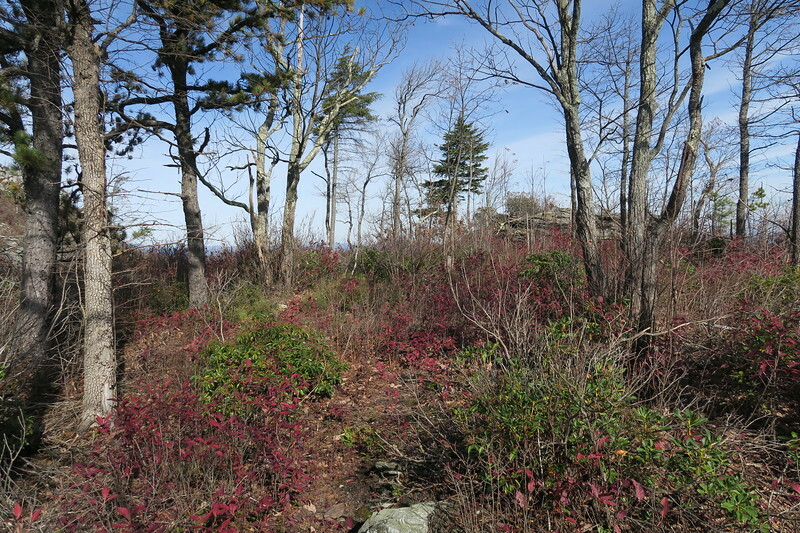 Any one of these colorfully named places would be worthy of its own hike. 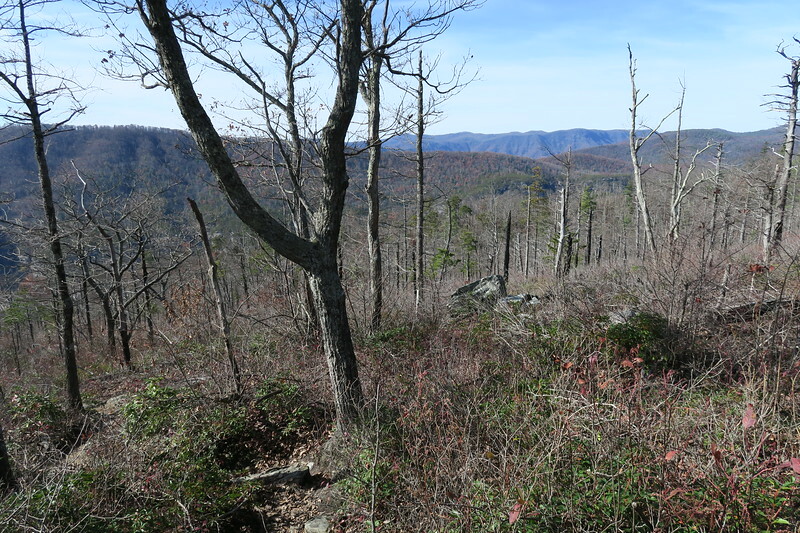 Put them all together and you have a Southern Appalachian classic. 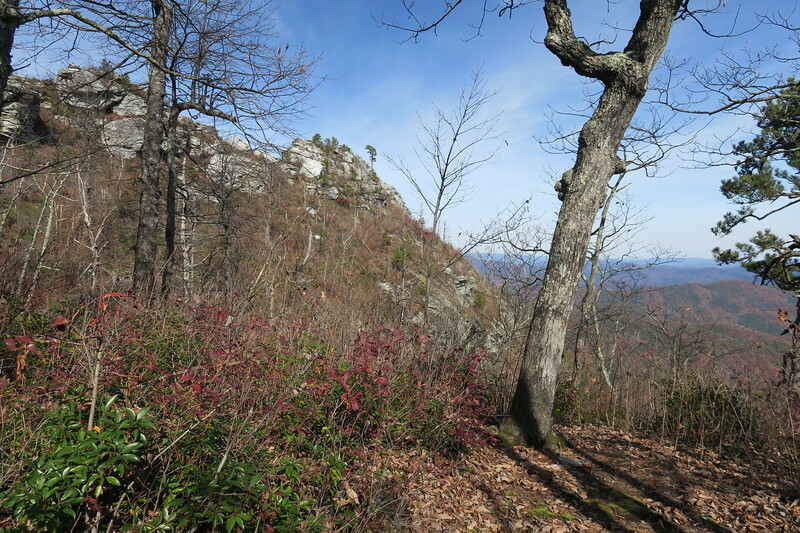 From the parking lot I'd first head north via the popular Table Rock Trail. 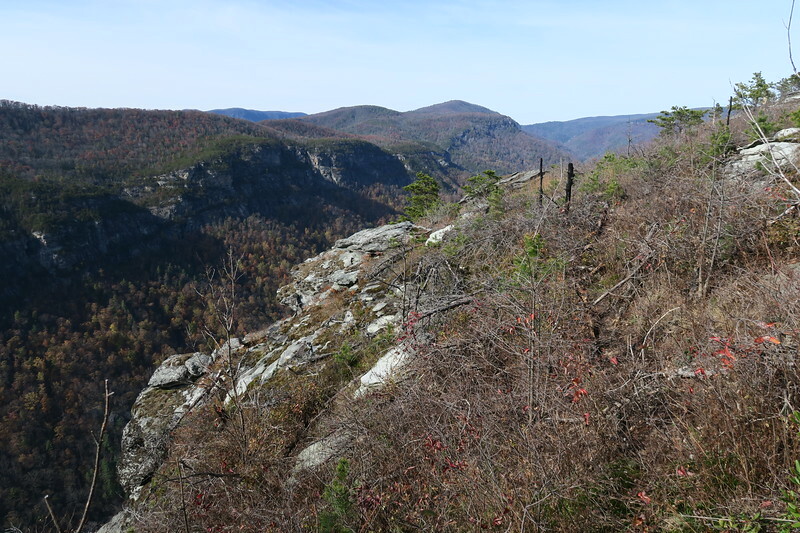 This two mile out-and-back portion of the hike would take me up to Linville Gorge's most iconic summit. 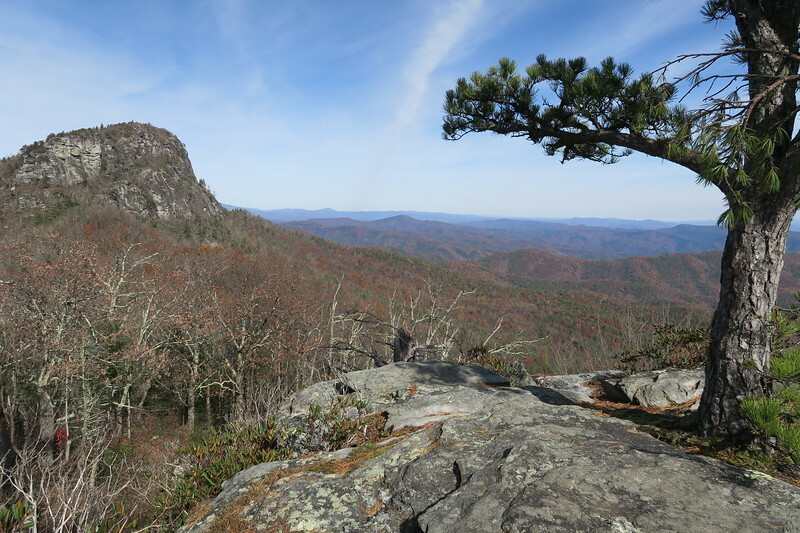 It's a peak I never tire of visiting, despite the crowds that it typically attracts. 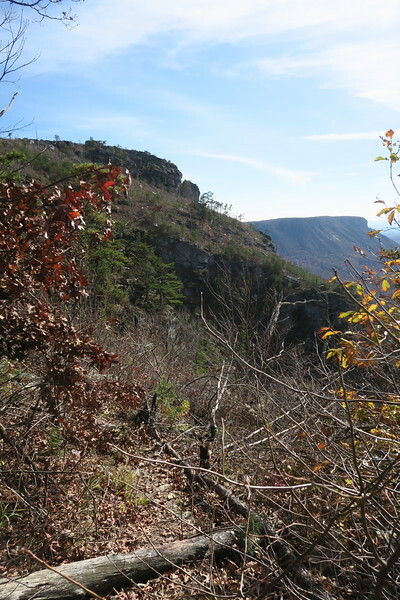 Returning from the summit I'd add on a visit to the aforementioned Devil's Cellar, an awesome viewpoint located within a massive fissure in the western cliffs of Table Rock. 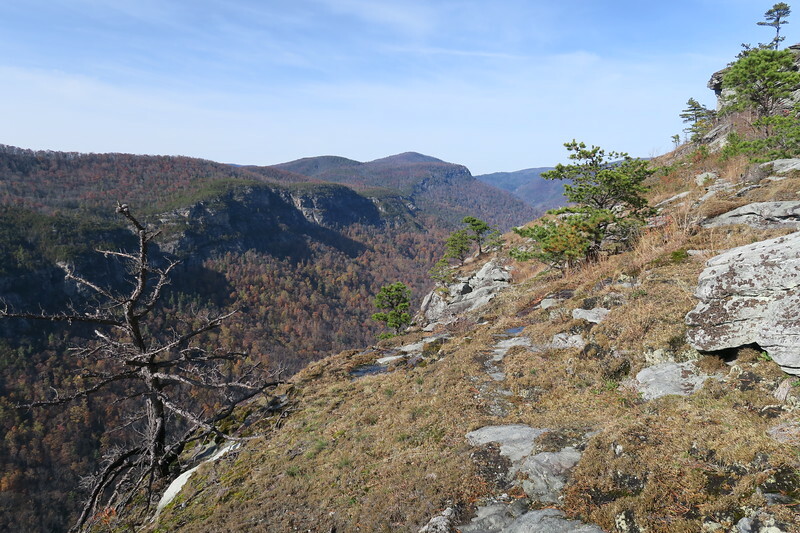 Upon returning to the parking area I'd cross to its southern end and set out once again, this time on the also-popular Mountains-to-Sea Trail towards a major climbing area known as The Chimneys. 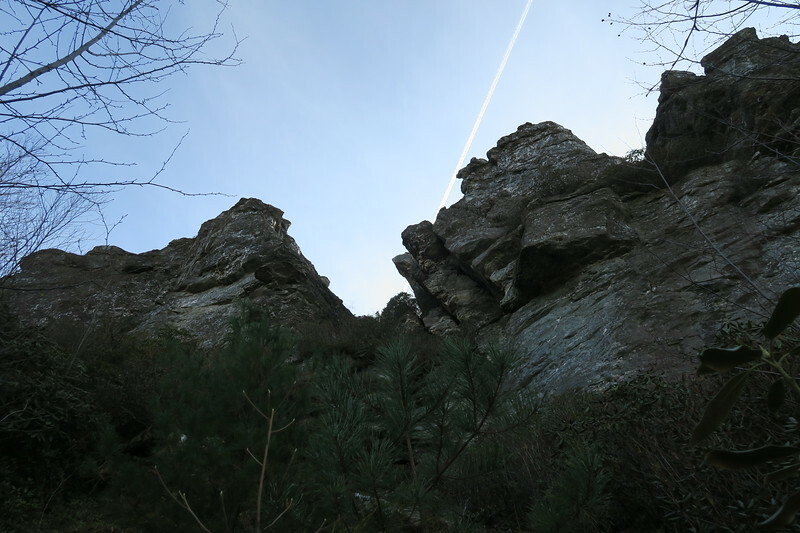 The Chimneys are an area of jumbled ledges and broken, exposed cliffs. 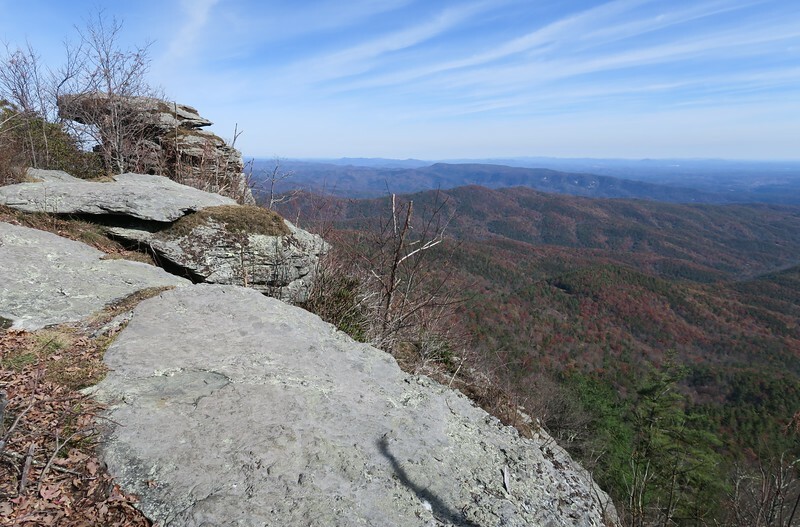 It's a fantastic place to hike through and one can easily see why it's such a popular place with the climbing crowd as well. 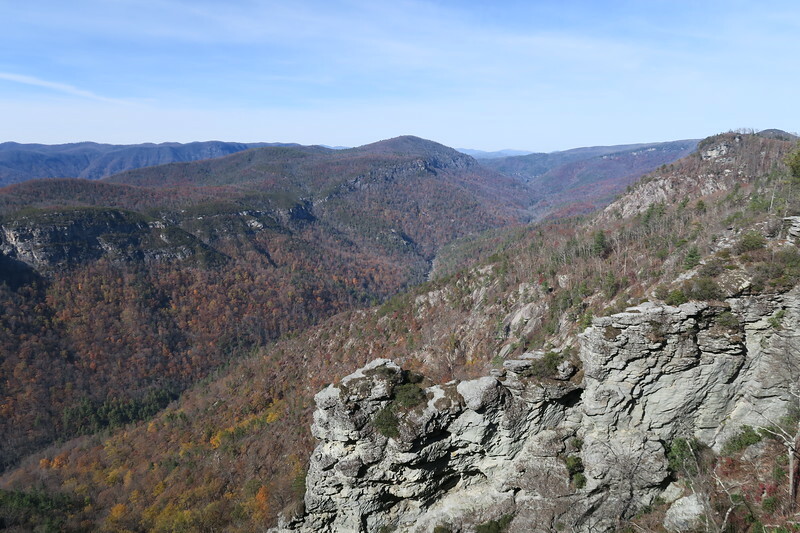 Beyond The Chimneys I'd continue south via the MST before making a right-hand turn onto one of Linville Gorge's many unofficial paths, the so-called NC Wall Trail. 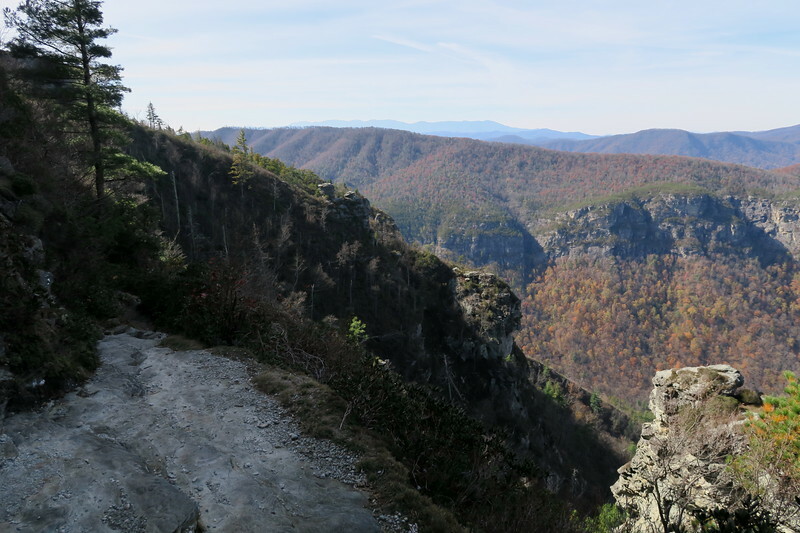 This footpath loops westward out along the cliffs to the south of The Chimneys, some of the highest unbroken cliffs in the entire Gorge. 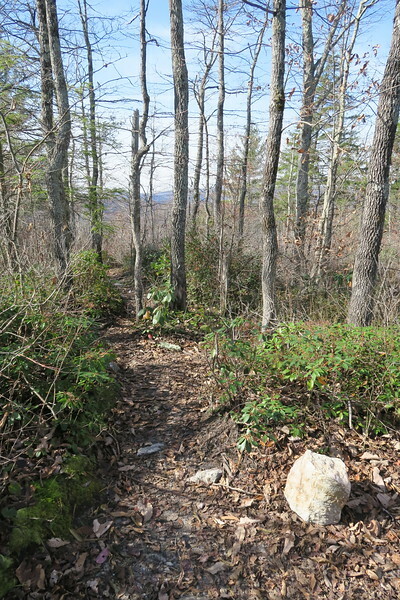 To travel the NC Wall Trail you need to have a good map (see my plug for the Avenza app above) and a good eye for when you inevitably lose the path and have to re-evaluate the direction you need to travel to regain it. 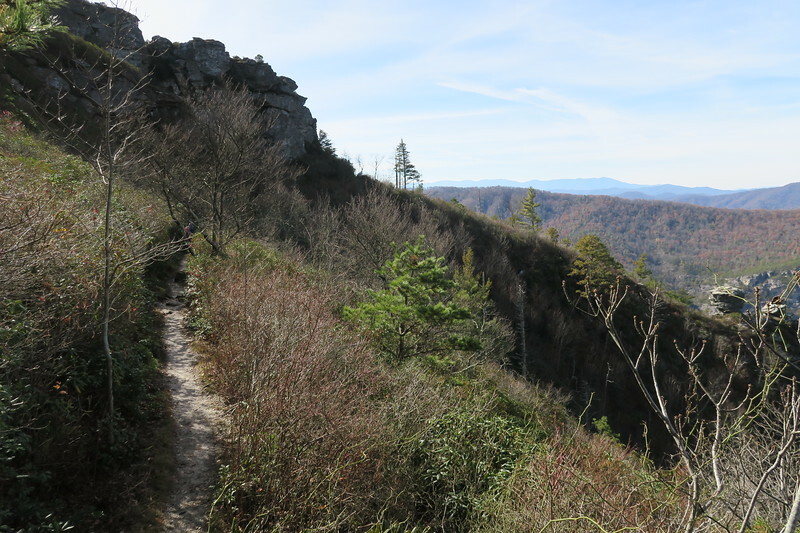 Descending from the MST the NC Wall Trail soon emerges above the appropriately-named Amphitheater. 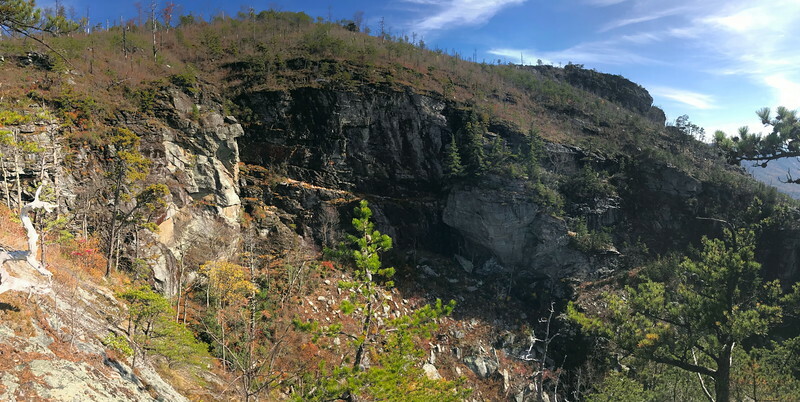 Here massive cliffs form a rough semi-circle of towering stone while nearly 1,500-feet below the Linville River rushes by. 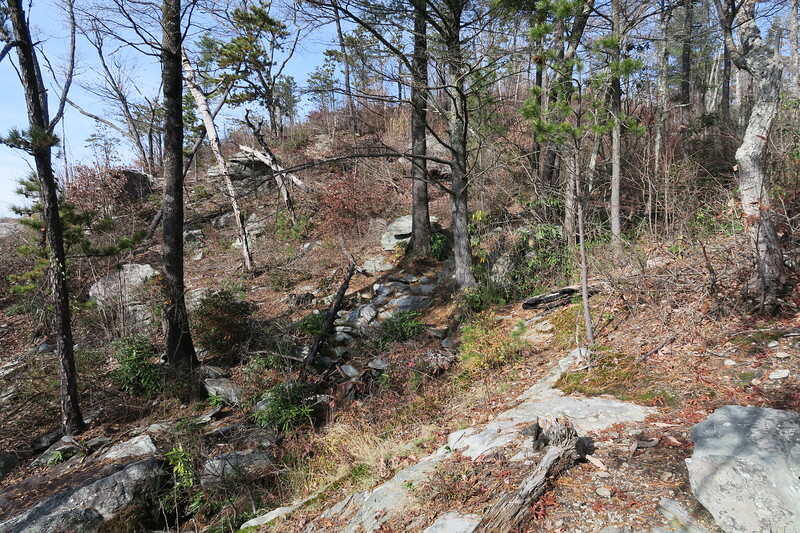 Heading back to the north from The Amphitheater the trail roughly follows the cliff-edge but you'll have to keep a close watch to avoid wandering off of it. 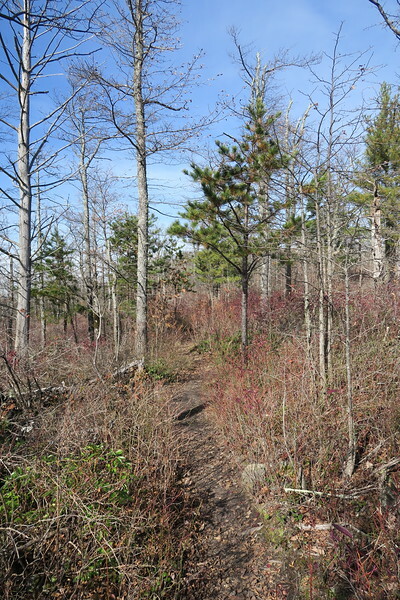 There are a number of places where the route is less than apparent and difficult to follow. 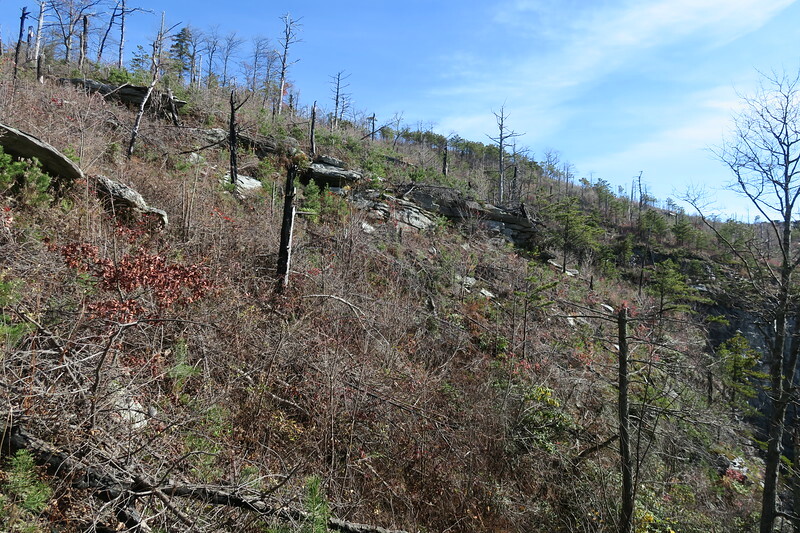 Like I said, though, if you generally follow the cliff edge you'll be on the right track. 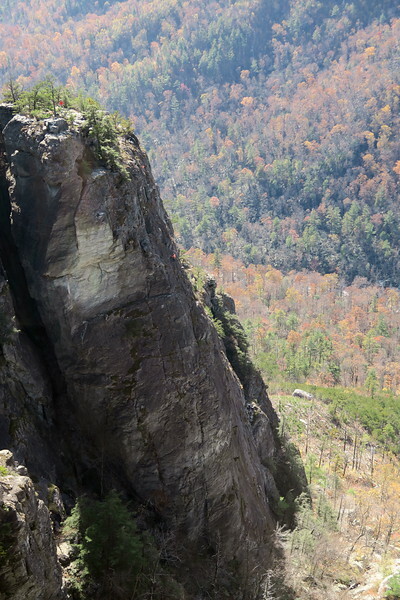 You'll know the North Carolina Wall when you see it. It's awesome. It's breathtaking. 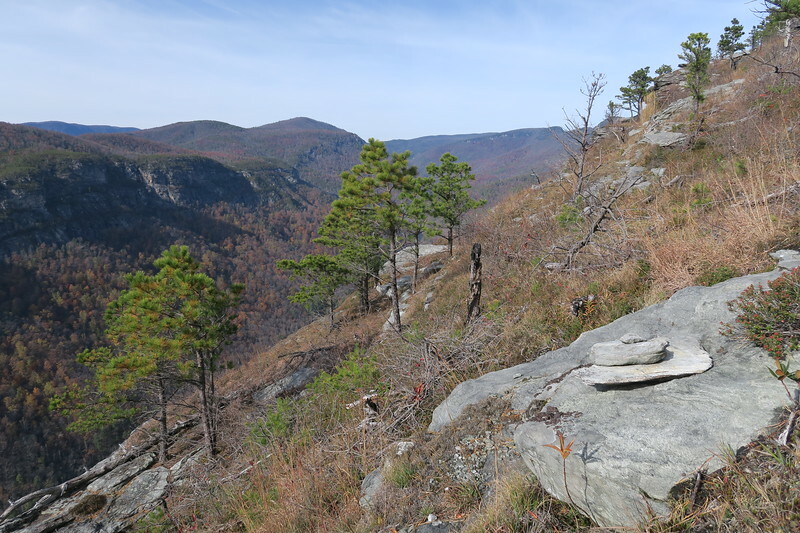 It's the perfect culmination for this already awe-inspiring hike. 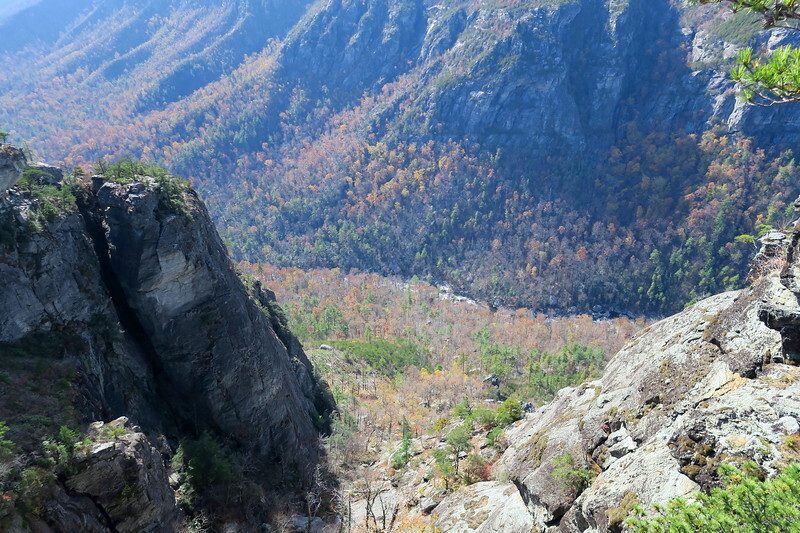 For about a half-mile the path snakes its way along the dizzying edge of this massive cliff-face. Stops were frequent. 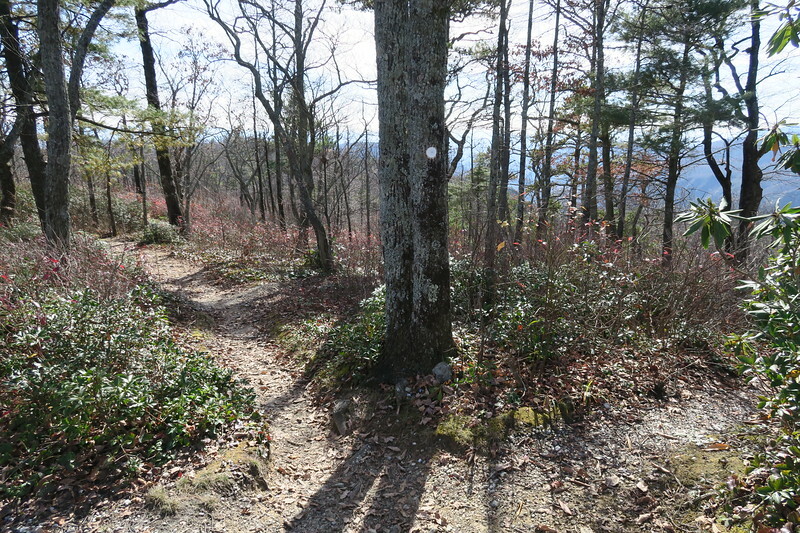 Every turn seems to offer up a new and amazing angle for pictures and view-gazing. 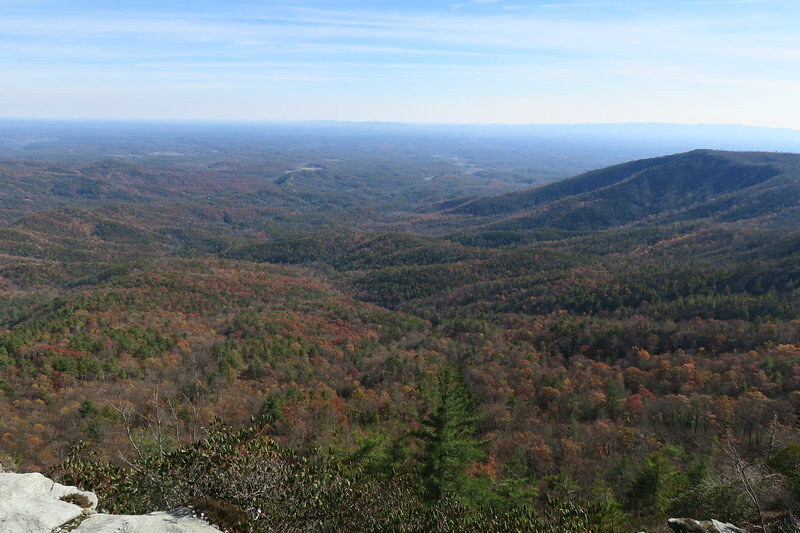 I tried to soak it all in as best I could but scenery of this magnitude is hard to mentally absorb. 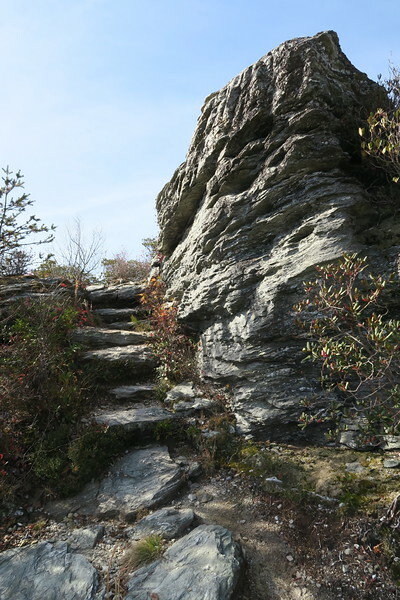 Wandering the cliffs northward I also made a side-trip over to another of Linville's unique rock formations popular with climbers known as The Camel. 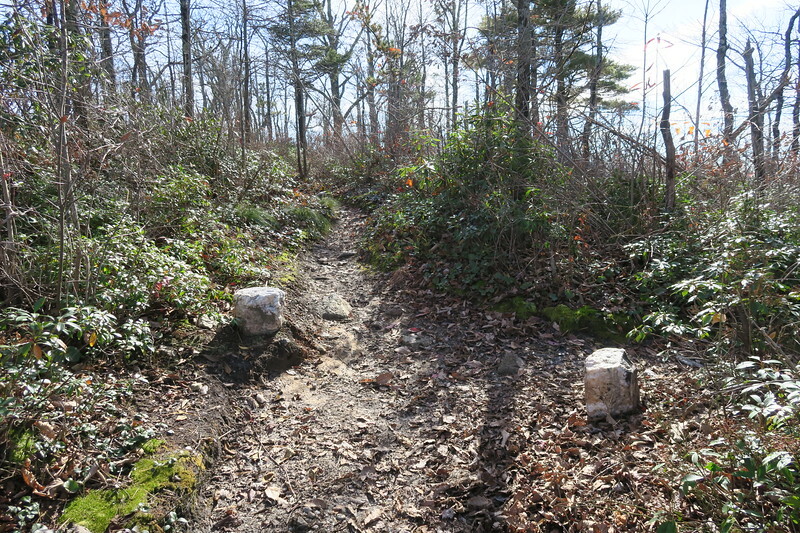 After The Camel I climbed back up to the MST, made a left, and simply retraced my steps through The Chimneys. 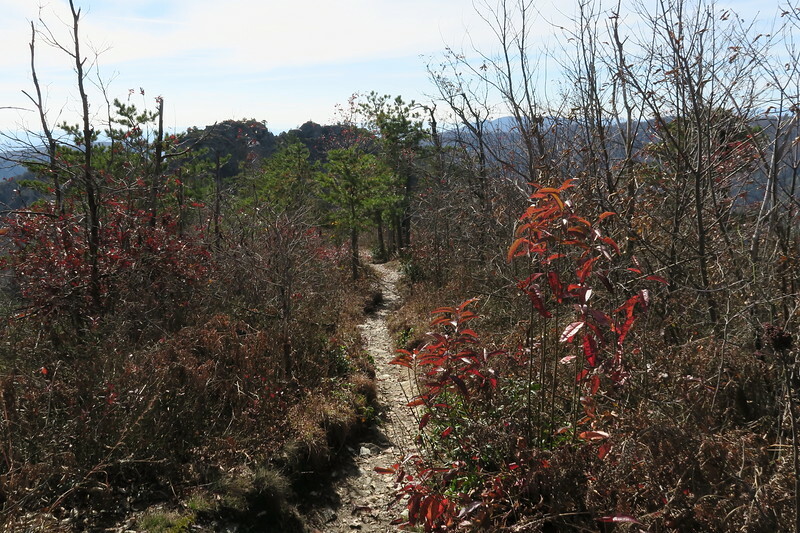 There are certainly worse stretches of trail to revisit. 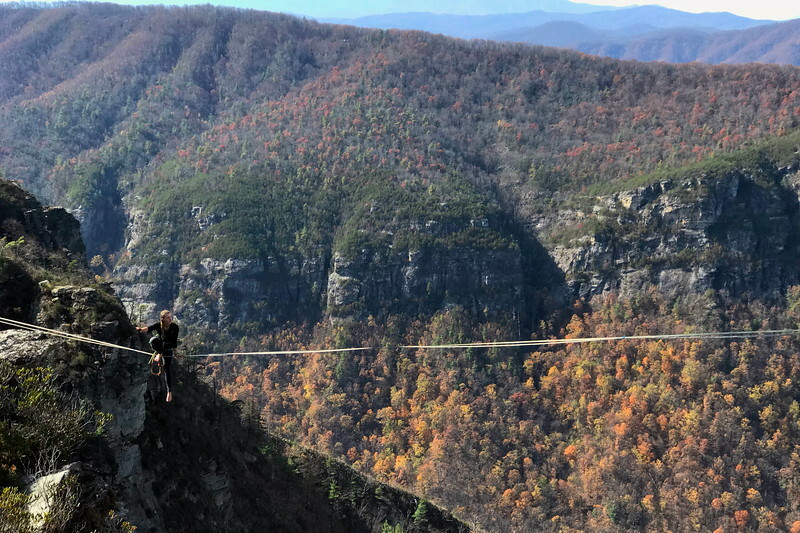 If you're lucky like me, you might even get to see folks enjoying one of Linville's latest crazes...high-lining...it's basically tight rope walking between cliffs! 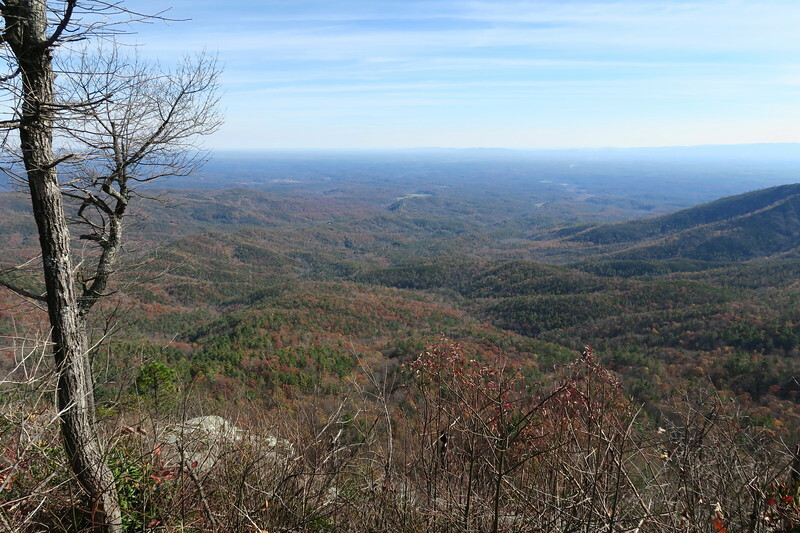 Not for me, but it certainly added one more excuse to stop and take in the sights. See? 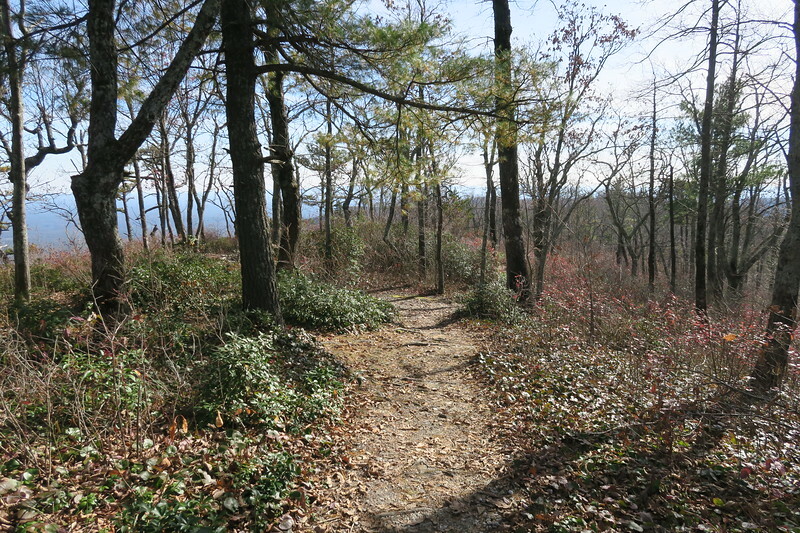 This hike has it all!! There's not much more to say that hasn't already been said. I'll let you get to the pics which show off all the amazing eye-candy better than I ever could describe it in words. 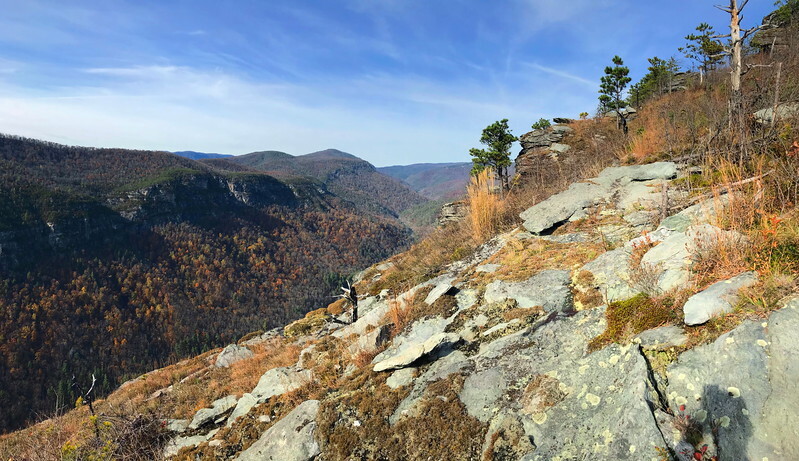 As you will realize, there are few places in the Appalachians quite like Linville Gorge and this short trek serves up its beauty in one massive dose. So strap your boots tight, grab your map, and prepare for some fun...and, as always...ENJOY!! !